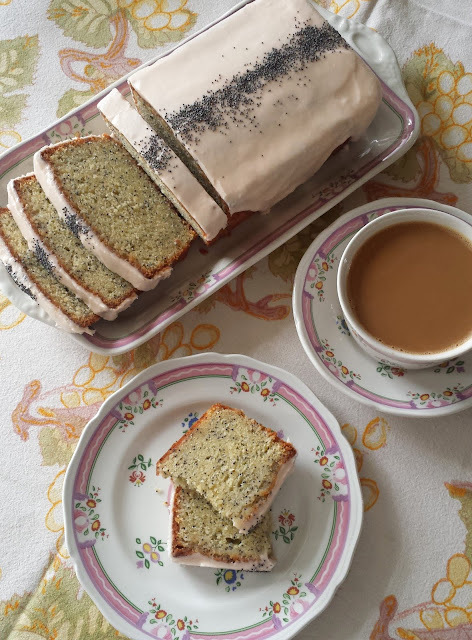 I think I have mentioned before that I sometimes share recipes on my blog mostly for my own benefit. Since I cook so many different things...in so many different places....and under such a variety of circumstances...it can sometimes be difficult to remember what I did on a particular occasion with a particular recipe. My blog has been a wonderful way to document—not just with words, but with pictures (which are extremely helpful)—what I did and how I did it. This documentation gives me a reasonably good chance of reproducing something that I particularly liked on a future date. 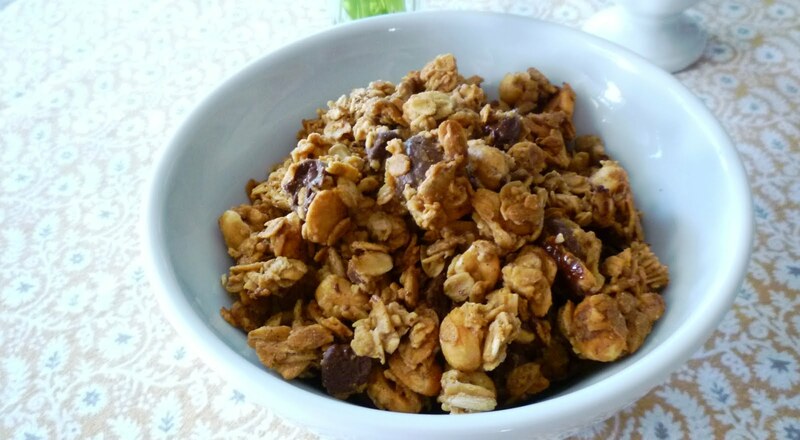 Today's post is one of those kinds of posts—although, I think anyone who loves peanut butter...and chocolate...and granola...will be happy to know about this recipe. I have only made this recipe with old fashioned oats. I think they give an addictively chewy and substantial result. I can only assume that quick oats would give a lighter—and also less clumpy (since the peanut butter goop has to cover more surface area with the more thinly shaved quick oats)—result. There were lots of comments and questions on Lebovitz's original post about putting the chocolate chips in the oven... Wouldn't they melt? Lebovtiz says that commercial chips are made with baking resistant chocolate so they will be fine. He goes on to say that if you chop up a bar of quality chocolate instead, you will have some difficulties (i.e.—melting in the oven). So...even though I was dubious... and even though several commenters had had difficulties with this very thing...I trusted that the chips wouldn't melt. (In general I think Lebovitz's recipes are accurate and reliable.) And just like he promised, they did not melt. I remember that they did seem to want to get soft....but found that if I carefully turned the granola over with a pancake turner—as opposed to vigorously stirring with a wooden spoon or spatula—that the chips maintained their shape and their presence in the granola. Because I was unable to stir the recent batch of granola, I did discover something useful. 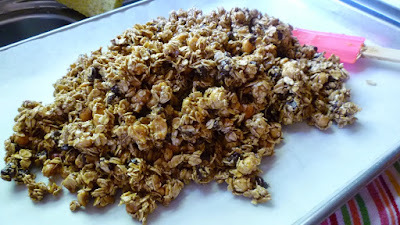 If you happen to be someone who prefers your granola in large, snackable shards (I admit to being one of these kinds of people), then not stirring is the way to go. You will be able to break the granola up a bit after it cools, but it will still tend to want to remain in large clumps and chunks. If you like a more free-flowing granola—appropriate for sprinkling over your yogurt at breakfast—make sure you stir once or twice (during the baking process, and as the granola cools). Finally, I discovered this last time that purchasing dry roasted nuts and seeds isn't as straight forward as one would hope. Look for nuts and seeds that have just nuts/seeds and salt. A national brand that shall remain nameless adds all kinds of junk and flavorings (including celery, paprika, onion and garlic flavoring...not things I want in my sweet granola...). If unadulterated dry roasted nuts are not available you can always purchase raw product and toast and salt them yourself. Or...simply buy nuts that have been roasted with oil. Either of these is better than being able to taste garlic...or celery...in your granola. 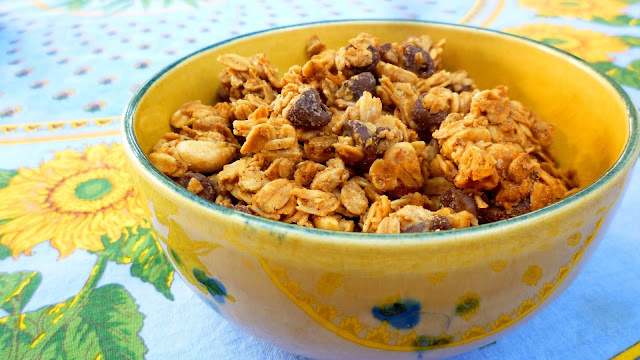 This really is a fine recipe...and if you love granola...and peanut butter and chocolate...you should definitely make it. I do have to admit though, I laugh every time I read one line of the recipe. 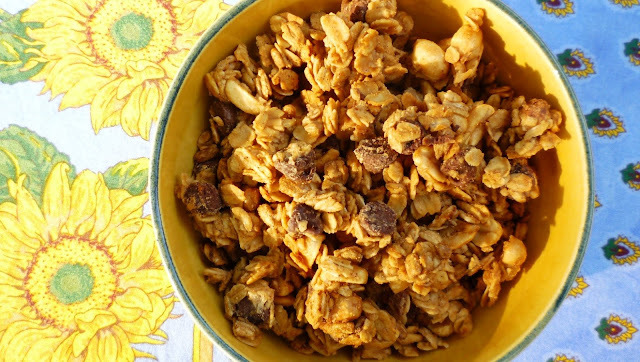 Lebovitz tells us that you can "store the granola in an airtight container at room temperature. It will keep for one to two months." It is of course likely that this is a true statement....but I'm not sure in what universe someone could manage to make a batch of this granola last for longer than a few days. If you want big shards of granola that you can snack on, don't stir the granola as it bakes. 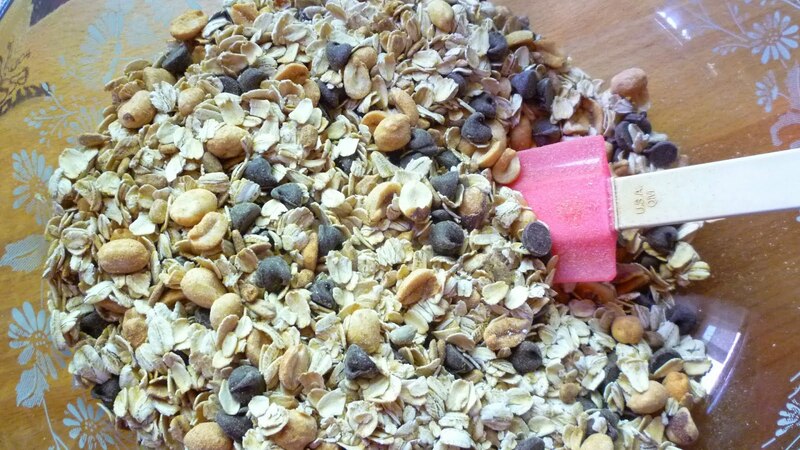 If you want a more traditional, separated, granola, be sure to stir once or twice during baking...and a few times as the granola cools. Preheat the oven to 325ºF (165ºC). 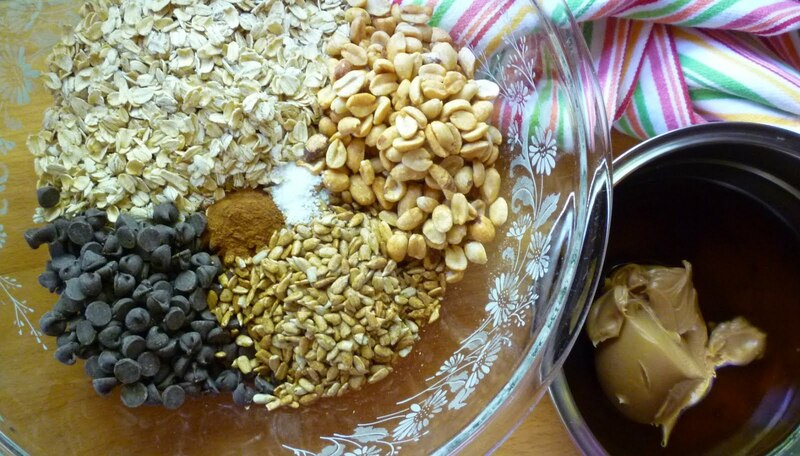 In a large bowl, mix together the oats, peanuts, chocolate chips, sunflower seeds, cinnamon, and salt. Scrape the peanut butter mixture into the dry ingredients and mix it in well, coating the oats, peanuts and seeds well. Transfer the granola mixture to a parchment-lined baking sheet and spread it in an even layer. Toast the granola in the oven for 20 to 25 minutes, or until the granola is a golden brown all over. If you are going to "stir" during baking (see note above), use a pancake turner-style spatula to flip the granola over in sections...stirring in the traditional sense will smash the softening chocolate chips. When you stir, make sure you get the granola on the edges moved toward the center and the granola in the center of the pan moved to the edges since the edges tend to darken quicker than the center. Remove from oven and let cool completely. Makes about 6 to 8 cups, depending on whether you have shards or crumbly granola. 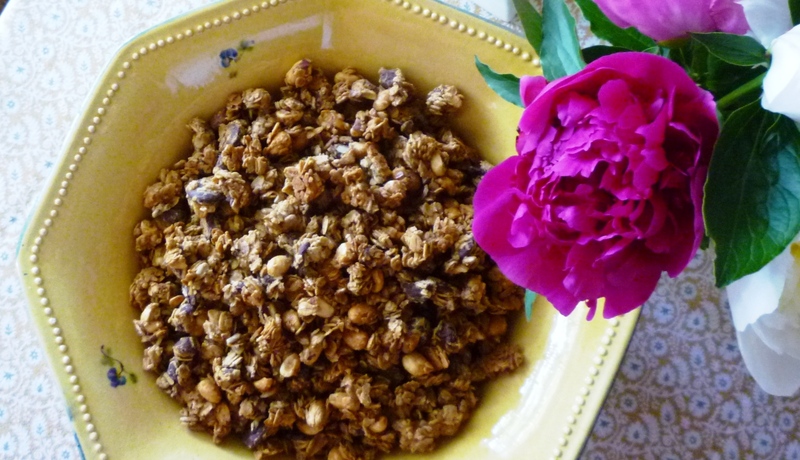 Storage: Store the granola in an airtight container at room temperature. It will keep for one to two months.